In Chile now, but taking a moment to reflect on a great couple months in Central America. A big reason I travel in winter is to discover new paddling destinations for my canoeing crews of year’s past. Last winter I was on a mission to check out the Zambezi. Many friends were interested in joining me, after I had smoothed out the details, on a future expedition down that iconic African river. That will not happen. My reconnaissance was a death-defying experience. Although I will not stop friends from paddling the Zambezi, I won’t choose to accompany them and I will recommend they make sure all their final arrangements are in order in case they are returned home zipped up in a bag. For me, it was a harrowing 6-day trip, but one of my life’s greatest adventures. One and done, and the Zambezi is not something I want to repeat, especially in the company of trusted friends and clients. A little digression, I am reworking my book River Stories to release it as an e-book at the same time Merlyn Carter Bush Pilot comes out (at an undetermined date this spring). Anyway, I am thinking about adding a bonus story to River Stories, I. I will say my crew on the Zambezi were great guys – talented, kind and fearless, but that river is a bad boy. Back to Central America. In addition to the birding trip that I am putting together with a top-flight El Salvador ornithologist, I am also working on a spectacular sea kayak trip in a chain of wilderness islands off the coast of Panama. Rob, in a sea kayak? I know it may seem hard to believe and maybe to some a betrayal. In the past, I was guilty of mocking, disparaging, and ridiculing kayaks and their goofy paddles. Canoes will always remain my watercraft of choice, but on big water, especially in wind, sea kayaks have some advantages. In Central America I have set down my sword and picked up the goofy paddle. I encourage you to be open to doing the same. 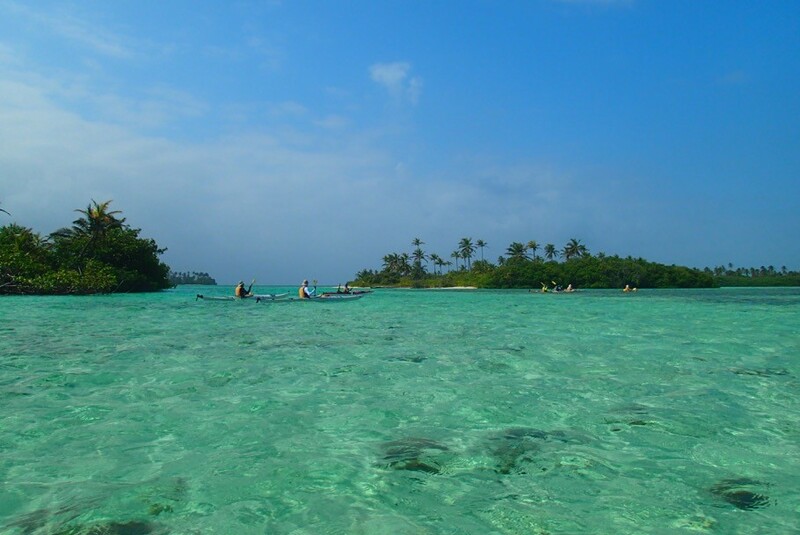 Next January join me on a 9-day expedition, sea kayaking through an archipelago of 365 islands off the coast of Panama. Camping on deserted islands. some of these which are of the single palm tree Tom Hanks’ “Castaway” variety. How great is that? Over a week of your January surrounded by turquoise, warm, and shallow waters, white sand beaches, and coral reefs perfect for snorkeling. Incredible or what? Our local Costa Rican guide for this trip is one of the most skilled paddlers and wilderness campers I have ever traveled with, and he is fun. Not only that, for safety and convenience, we will be dogged by a power boat that will carry our camping gear, provisions, and if your arms get tired, you. And, get this, the boat will carry ice! And, get this! A cook! All this for less than half the fee of my fabled Noatak canoe expeditions in the Alaskan Arctic. All over the globe, coral reefs are imperiled. This is your chance to join me to experience incredible corals, sponges and reef fish in all their colors and splendor, in a wilderness setting while they still exist. Your chance to camp safely on tropical islands devoid of bugs and snakes. Your chance for a week-and-a-half escape from modern life and a return to the cycle of the sea – paddle, swim, sleep. More details upcoming on my blog. But I want this to be a fun, low impact group, (8-person crew maximum). Get on the crew list ASAP.